Drivers unable to get closer than 1.5 seconds to the car ahead despite being faster? Check. Alonso complaining about lack of engine power and then retiring despite a suspicious lack of noticeable issue? Check. Verstappen’s car breaking down at the start of a race once again? Yep—sorry, thousands of Dutch fans who showed up. After his teammate retires, Ricciardo pulling a podium finish out of seemingly nowhere? You bet! The two Force India drivers colliding? Not just once, but twice! Drivers complaining about being forced off the track in wheel-to-wheel action? Of course! Yep, this Grand Prix had it all, including a seemingly-promising late-race charge by Sebastian Vettel on Lewis Hamilton that ultimately proved inconsequential. 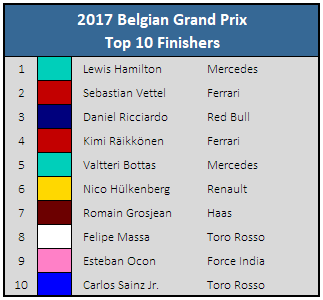 Despite getting inches away from Hamilton’s gearbox on the final safety car restart, Mercedes power proved dominant once more, as even with a good helping of slipstream up the famous Raidillon corner the Ferrari simply couldn’t keep up to pass on the ensuing straight. After that, the dirty air produced behind Hamilton’s car in the fast, sweeping corners of Spa prevented the Ferrari from getting in DRS range. 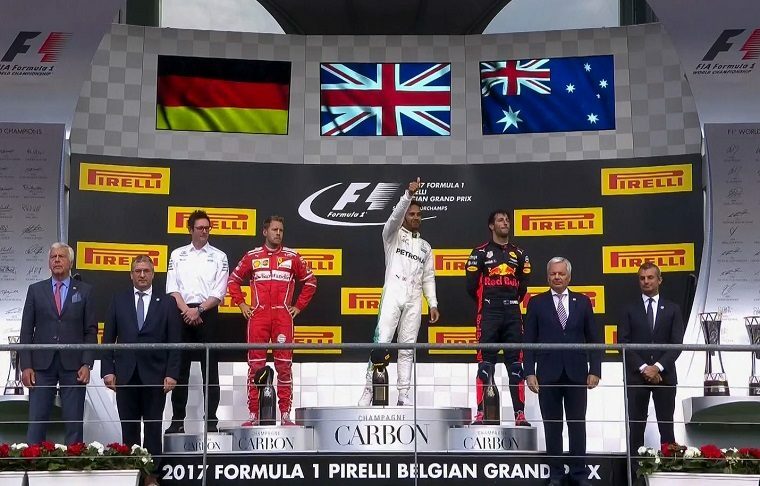 Kudos must nonetheless be given to the British driver, who excelled all weekend particularly when it mattered most: on Saturday, where he placed his car on the top spot of the grid with a blistering time and equaled Michael Schumacher’s record of 68 career pole positions. 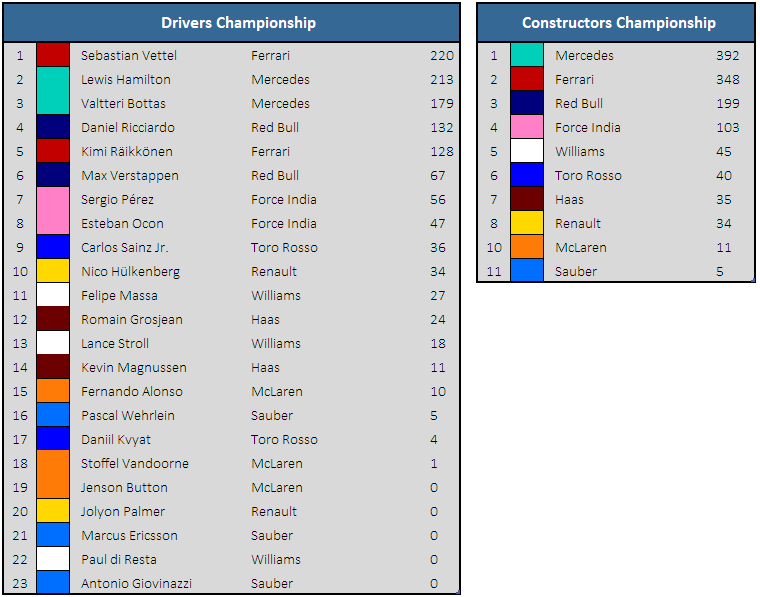 Hamilton is now just seven points down on Vettel in the drivers championship as the F1 circus heads to Monza, home of Ferrari where the tifosi will no doubt be disappointed unless by some miracle Mercedes somehow fails to use its considerable power advantage at the most power-dependent track on the calendar.